Morning Song Concert Atlanta is producing its first regional concert series in Gwinnett Country. The 2009-2010 season of concerts will be held in the Red Clay Theatre in downtown Duluth, GA. These concerts will be FREE thanks to our community sponsors: Morning Song Music Group, Duluth Adventist Christian School, and more to be announced. 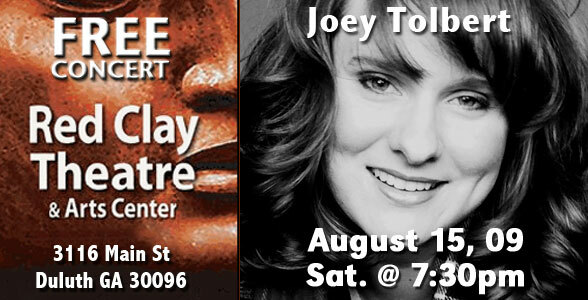 For our inaugural concert we will feature Joey Tolbert from Chattanooga, TN who is currently working on her second CD. Her eclectic music ranges from folk to traditional hymns, each sung in her personal and intimate style of ministry. Joey takes her audiences on a journey of knowing God through her incredible talent and love of ministry. She joined the Morning Song National Christmas Tour in 2005 and blessed listeners arround the nation with her beautiful alto voice. Since then she has continued her solo career while also touring with the ladies gospel group, “Message of Mercy” which recently produced their first concert DVD.